To be clear, as a fiscal conservative I have never supported policies that advance government expenditure for the express purpose of job creation. Indeed, I believe that the private sector is far better equipped to promote lasting jobs growth than Washington will ever be. ….Congress is charged by the Constitution with providing for the common defense by raising and supporting our armed forces. We don’t spend tax dollars to protect American jobs, but to protect American lives. As such, it is accurate to point out that cuts in defense spending will cripple a critical industry, result in huge job losses and erode our ability to provide for the common defense. 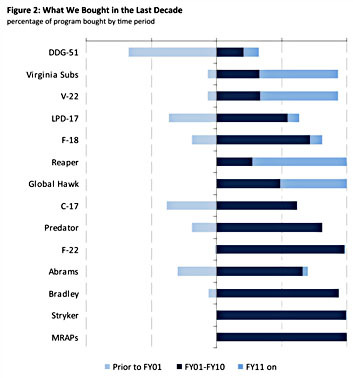 The study shows there’s one big reason the brass are concerned about budget-cutting discussions in Congress: They’ve been double dipping into the taxpayer’s pocket to finance weapons purchases. Of the roughly $1 trillion spent on gadgetry since 9/11, 22 percent of it came from “supplemental” war funding—annual outlays that are voted on separately from the regular defense budget. Those bills are primarily intended to keep day-to-day operations running in Iraq and Afghanistan—meaning that if a member of Congress votes against a supplemental spending bill, she exposes herself to charges that she doesn’t “support the troops” in harm’s way. But once the services got the supplemental money, they managed to spend $232.8 billion of it back home on the manufacture of costly weapons like Abrams heavy battle tanks and the troubled F-22 jet fighter—neither of which has proven particularly useful in counterinsurgency warfare. There’s more at the link. Bottom line, though, is that the Stimson report suggests that the Pentagon has very successfully modernized its forces over the past decade and isn’t quite the red-headed stepchild McKeon makes them out to be. If budgets need to be cut, the Pentagon will just have to figure out where its fat is like everyone else.